If you follow the Bullpen Report here, you might have noticed a new name pop up as the “second” guy in the Pittsburgh bullpen (meaning the guy behind both the closer and the guy most likely to usurp the closer). Benajmin Pasinkoff bestowed that honor on one Arquimedes Caminero in last night’s Bullpen Report, displacing Jared Hughes as the man behind the man (Tony Watson) behind the closer (Mark Melancon). Given that I know nothing of this Arquimedes fellow other than the fact that his parents might have been trying to name him after the Greek mathemetician (I like to think Archimedes would have liked sabermetrics), I gave his player page a gander. One portion of his player page stood out in particular. That’s some serious gas coming out of nowhere. I know it’s a sample of just 39 batters, but it’s velocity, not BABIP. And if people can be concerned about Melancon’s significant drop in velocity after facing just 38 batters this year, we can certainly take note of Mr. Caminero’s heat. If you just look at fastball velocity on the relievers leaderboard, Caminero is second so far just ahead of Kelvin Herrera, Craig Kimbrel and Trevor Rosenthal and trailing only Aroldis Chapman. That’s good company to say the least. To be fair, the next seven guys on the list don’t hold a candle to the top five flame-throwers in terms of production, and the sixth guy on the list, Miguel Castro, was unable to parlay his heat into a lengthy stint as Toronto’s closer. Castro’s gas has not translated to strikeouts in his 44-batter sample this year. He’s generated swinging strikes on just 8.1 percent of his pitches and has a pedestrian 18.2 percent strikeout rate as a result. Caminero, on the other hand, has a 17.4 percent swinging strike rate so far and had a 15.8 percent swinging strike rate last year in a 31-batter sample. Caminero’s strikeout rate this year sits at 28.2 percent. It would seem his heat better translates to strikeouts. It’s appears Caminero’s cutter can miss bats, and he also throws the cutter harder than most others as his cutter velocity ranks seventh among relievers so far. According to the PITCHf/x leaderboards over at Baseball Prospectus, hitters have offered at his cutter 15 times so far this season and have come up empty seven times. For the record, Caminero’s player page is identifying his cutter as a slider, and he also throws a third pitch spraingly that is classified either as a splitter or a change. Long story short, he’s got serious heat and a hard breaking pitch that have yielded excellent results so far. 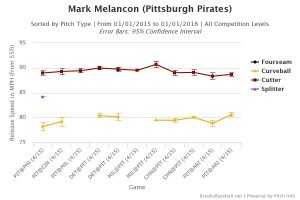 I won’t spend too much time speculating on Caminero’s chances of getting saves at some point, but Melancon’s velocity issues are undeniably troublesome as he’s got just a 2.7% K-BB%. 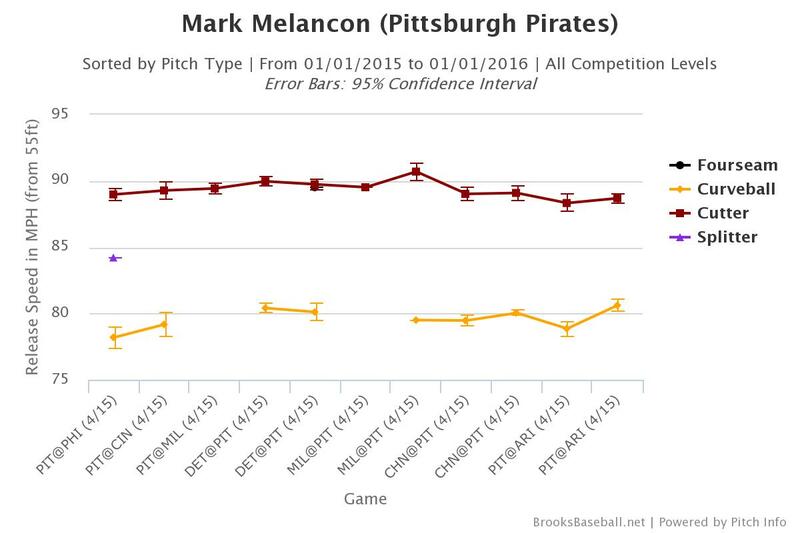 And it doesn’t seem that Melancon is picking up any steam. As for Watson, he’s not exactly your prototypical closer. For one thing, he’s left-handed. Of the 28 guys with a reasonable hold on a closing gig right meow, just four are left-handed. Aside from that, Watson is a sinker/change guy when typically closers lean on a more conventional fastball and breaking pitch, generally a slider. None of this precludes Watson from closing, I’m just not having a terribly hard time imagining Caminero getting a shot at some saves if the Pirates move on from Melancon at some point. Outside of shallow leagues, Caminero is worth a look as long as you don’t have terribly short bench settings. We hoped you liked reading Getting to Know Arquimedes Caminero by Brett Talley! Ive been waiting for this article since I first heard about the trade. Awesome stuff! Also, His dad named him Arquímedes Euclides Caminero after seeing the name in a Math textbook.